After three months of heartache, heartbreak and triumph, Teknision’s Chameleon Launcher has hit version 1.0 and is now available to purchase in Google’s Play Store. The story of how the Ottawa team got to this point is, according to a blog post, one of long nights, Tim Horton’s runs and lots of hard, hard work. 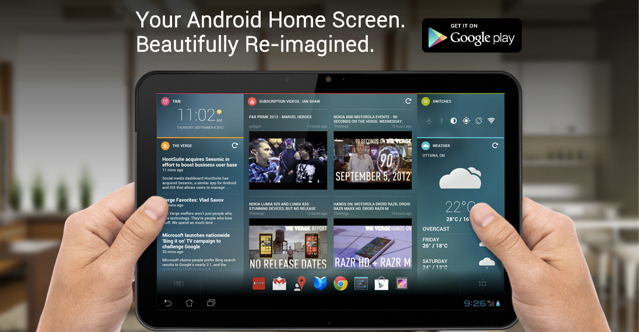 What began as a limited idea for a replacement launcher for 10-inch Android tablets, with customizable widgets and a modular design, has expanded (or shrunk, depending on your opinion) into compatibility with the growing 7-inch tablet market and, in the future, Android phones. For those Kickstarter supporters who braved the (very buggy) beta versions, this update will be a nice bump in functionality. The Chameleon team stresses that the mission isn’t done: there are no Google+ or Calendar widgets just yet, and the Gmail functionality is a bit wonky. They released the 1.0 version at this time because, as we know, software is never static, and they wanted to fulfill their promise of releasing a finished product within the date promised on their Kickstarter page. The big question is whether Chameleon is really worth the money. At $10, it’s quite expensive for a tablet app, and you’ll need to be a pretty heavy user to justify it. But once you install it and begin to test its flexibility and revel in the sheer amount of customization, you’ll be immediately impressed with Teknision’s, ahem, vision. The missing functionality is frustrating, but you’re buying it now to use for a long time. When I spoke to the company’s founder, and Chameleon’s head architect, Gabor Vida, earlier this summer about the project, he was very forthright in his criticism of the Android home screen. Unlike a phone, real estate on a tablet is plentiful and largely untapped. While Honeycomb introduced scrolling widgets and a modicum of dynamism to the Android tablet experience, the space lacked a true purpose. There was so much more potential for acquiring information from the various home screens that was not being utilized. We’ll have a full review of Chameleon 1.0 in the coming days, but if you’re feeling feisty, and liquid, you can purchase the homescreen replacement for $10.26CDN.